SECOND FROM TOP: Mae Horseman, Nahata Dzil commission secretary, points out housing areas on a map of Nahata Dzil Chapter. Undoubtedly, the Navajo Nation's newest chapter was created under tragic circumstances. Hundreds of people, displaced by the 1974 Navajo-Hopi Land Settlement Act, needed a place to live. In the early 1980s, the federal government bought up several large ranches surrounding the town of Sanders and took them into trust. Homes, schools and a clinic were built here for the relocatees using federal funds administered by the Office of Navajo and Hopi Indian Relocation. The first residents, according to Nahata Dziil Commission President Darryl Ahasteen and Secretary Mae Horseman, didn't acclimate well. "They were used to having a couple of square miles of customary use area," Ahasteen explained. "Now they were down to one acre." Added Horseman, "They had spent their days fetching water, building fires, tending livestock, just surviving. Then all of a sudden, they could just turn on the lights and water, and they only had a few livestock, if any. They didn't know what to do with themselves." Horseman and Ahasteen both recall elders dying of what could only be described as a broken heart. Today, however, there are two generations who grew up in this community, which became a chapter in 1991. It's the only home they've known, and they love it the way anybody loves their home. "We have people working in Gallup, Holbrook, Albuquerque, even Phoenix and Tucson," said Horseman, "but they come home on the weekends. If you come here on a Friday night, you'll see a long line of cars coming in on the Beeline Highway (from Phoenix). Then, Sunday night, you'll see them all heading back again." To tell the truth, Nahata Dziil is a pretty nice place to live. Every home is on a paved road and has running water and electricity. There are range units for those who want to ranch, easy access to I-40, and a variety of county, state and tribal services available. The town of Sanders, which is on a peninsula of non-reservation land extending into the chapter, has a dollar store, a gas station, a trading post and a few other businesses. The higher elevations sport an impressive variety of wildlife -- and because they were able to start with a clean slate and control grazing, "We don't have any problems with feral horses unless some wander in from other chapters," Ahasteen said. The downside? "No jobs," Ahasteen said. Horseman agreed. "When the federal government moved us here, they promised us economic development," she said. "It hasn't happened." Name: Nahata Dziil is the only fully planned chapter on the Navajo Nation. When the Office of Navajo and Hopi Relocation set aside the New Lands, they asked the residents how they wanted it divided up. According to Nahata Dziil Commission Secretary Mae Horseman, three relocated medicine men -- Ram Herder, Silago and Kee Begay -- started holding meetings with the people and came up with much of the plan that exists today, with areas set aside for housing, business and grazing. Accordingly, they named this place "Nahata Dziil" -- "Planning Strength," or "Strength through Planning." It is still colloquially called "New Lands," however. 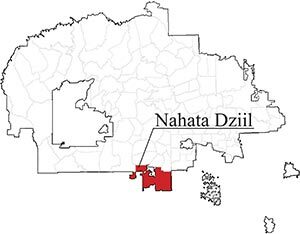 Population: From the original 442 residents who formed the chapter in 1991, Nahata Dziil has increased nearly fourfold to 1,652. This is especially remarkable considering that to live here, you have to either be a relocatee, a descendant of a relocatee, or have an invitation from a relocatee. Form of government: Nahata Dziil is one of only eight certified chapters to have adopted an alternative form of government to the usual chapter meeting popular vote, and one of only two to have a representative commission form of government, similar to that in some counties. Although it's been five years since the switch, "Some people still say, "Where is my vote? I don't get a say!'" said Horseman. "We need to educate people that they get a say when they vote for the commission." The new form of government, which does not require waiting for a quorum of 25 chapter members, is much more efficient, Horseman said, and most residents are happy with it. Issues: With its high unemployment rate and easy access to liquor stores in Sanders and Chambers, the New Lands have a high rate of alcoholism. Three more liquor permits are available on private lands within the chapter, and the Nahata Dziil Commission is already bracing to lobby against any more bars or liquor stores within the chapter boundaries or nearby. Some residents, however, are grateful for the establishments. "They would rather see their relatives buy a bottle and come home than get stranded in Gallup or Winslow," Commission President Darryl Ahasteen explained. Also, because it was so carefully planned, the community is running out of homesite leases in the designated housing areas. Clans: Before relocation, Navajos living in this area were mostly of the Honágháanii Clan. Now, of course, nearly every clan is represented here. It's one of the few chapters where it's easy to find someone to date who is not related to you. And the chapter has set aside some land along Interstate 40 for development, along with a 600-acre tract and a 38-acre one a few miles north of the freeway. But, other than the Navajo Travel Plaza and Preferred Sands' fracking sand mine in the eastern part of the chapter, no businesses have emerged. The sand mine is a gold mine for the chapter. The last administration negotiated a $108,000 annual lease for the surface rights to the land, which Ahasteen said is up more than 100 percent over the original lease. "But I think we could have done better," he sighed. "They're making a lot of money over there." Horseman, a former Navajo Nation judge, says proper procedures weren't followed to develop the contract, and she thinks the chapter may have some grounds to insist on renegotiation. A shopping center with a grocery store for an anchor -- currently, Nahata Dziil residents have to drive 50 miles either east to Gallup or west to Holbrook to stock their fridges -- is in the planning stages. The chapter has lots of good weavers and artisans, and Ahasteen would like to build a sort of artists' "strip mall" to showcase their wares. In the absence of that, one local resident has suggested printing a map to the artisans' houses that could be distributed at tourist shops in the area. Then there's the Pinta casino. Twin Arrows' smaller cousin on I-40 was supposed to open this year, but the chapter hasn't heard a thing lately and ground hasn't been broken. "Maybe they're waiting for Twin Arrows to pay off its debt," suggested Horseman. Meanwhile, Bill Inman thinks the chapter should gamble on what he says is a sure thing: beef cattle. Inman, manager of the Padres Mesa Demonstration Ranch -- a pilot project set up by ONHIR to model best practices to the relocatees who stayed in ranching -- has been working with the holders of Nahata Dziil's 14 range management units (calling themselves the "14R") to upgrade their herds and keep the careful records necessary to market their beef to premium buyers. In recent years, Padres Mesa and the 14R have been selling cattle to Labatt Food Service out of Albuquerque, which finishes the cattle, processes the beef and sells it to the Navajo casinos. Since the opening of Twin Arrows, Inman said, demand has skyrocketed -- especially after the premier casino's skeptical chefs consented to a blind taste test and chose Navajo beef out of several premium brands. "They went from wanting 300 head to 1,300," Inman said. "We're not going to make 1,300, but we'll be knocking on its door." Inman envisions the 14R -- an unprecedented collaboration where ranchers pool resources for immunizations, breeding, etc. -- being replicated all over the Navajo Nation and even with other tribes. "Once we get this thing going -- and it's already going faster than we can keep up with it -- we'll have started an economic engine," Inman predicted. But is it really possible to get groups of independent-minded Navajo ranchers together with no fighting? "We do fight," admitted Vergie Yazzie of the 14R matter-of-factly. "But we get things done anyway." In addition to prime domestic livestock, Nahata Dziil is home to some premium wildlife. When he was interviewed by the Times on Monday, Inman was just returning from showing a crew from the hunting show "Bone Collector" around the ranch. Inman said the show will be about how ranchers can manage both for wildlife and cattle. "We do have trophy elk here, a lot of them," confirmed Horseman. It's another business Nahata Dziil is trying to take a bite of. Horseman said she recently learned trophy animal permits on the Navajo Nation can go for $5,000 to $6,000 -- and not a penny goes back to the chapter where the animal is taken. As a certified chapter, "We need to see if there's some way we can make them go through us instead of the tribe," Ahasteen said. The hunting guide business is also very lucrative, and Ahasteen knows some excellent Navajo trackers who would make great outfitters with a little business training. As a new chapter, Nahata Dziil is not overly bound by tradition. It was among the first three chapters to get certified, and is still one of only eight that have adopted an alternative form of government. If anyone is in a position to capitalize on an abundance of resources, it's probably this youngest of Navajo Nation governments. They may have to fight, but they'll get it done.